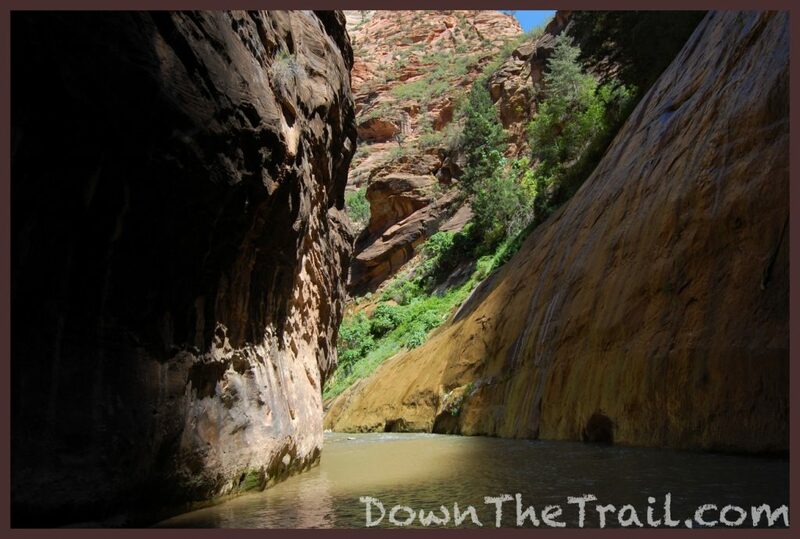 Day hike the best part of the Zion Narrows from the bottom-up. No permits, maps, rentals, or expensive shuttles are necessary! Just bring your camera and a sense of adventure. ACCESS: free shuttle bus only throughout most of the season (Generally early February through late November). Drive up the main canyon to The Temple of Sinawava when buses are not in operation. 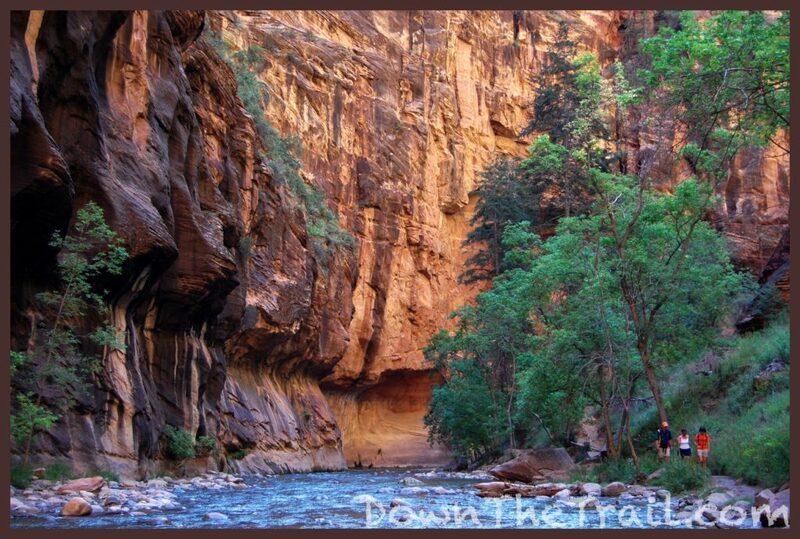 ROUTE: Follow the Riverside Trail for one mile to the shore of the Virgin River. 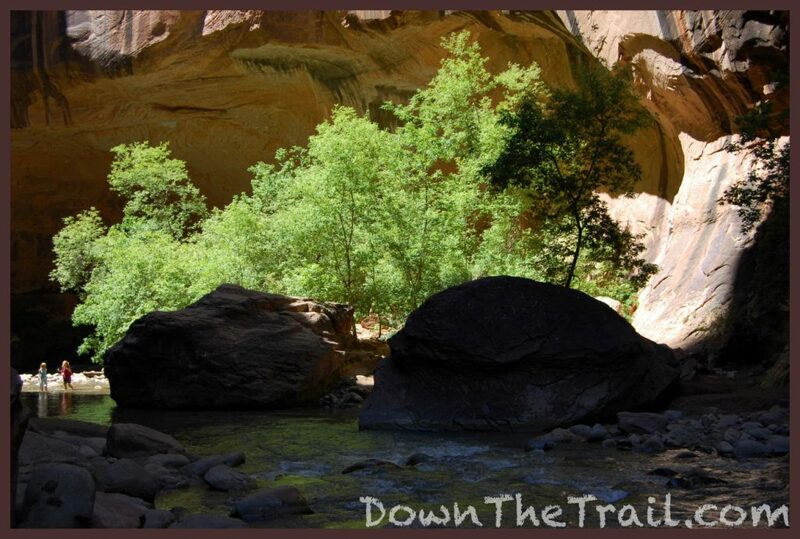 Follow the canyon up-river to its junction with Orderville Canyon and beyond. You will have to walk in the water and get your feet wet. 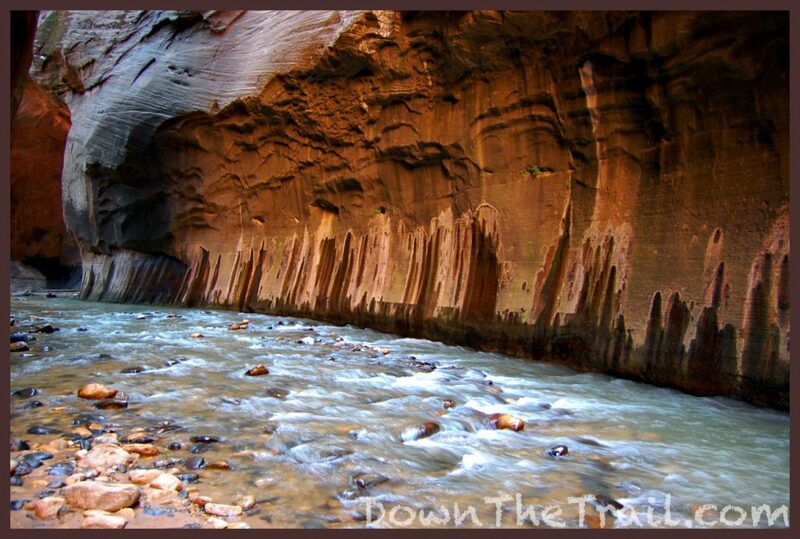 Zion’s Virgin River Narrows is one the most classic hikes in all of our National Parks. High walls of red sandstone tower above tranquil, flowing water in the desert of southern Utah. 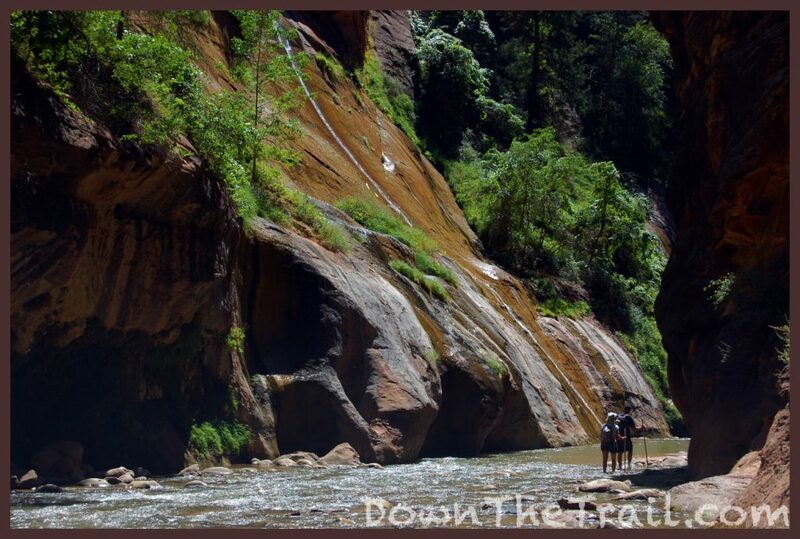 Once National Geographic rated it as the 5th-best adventure in the United States. 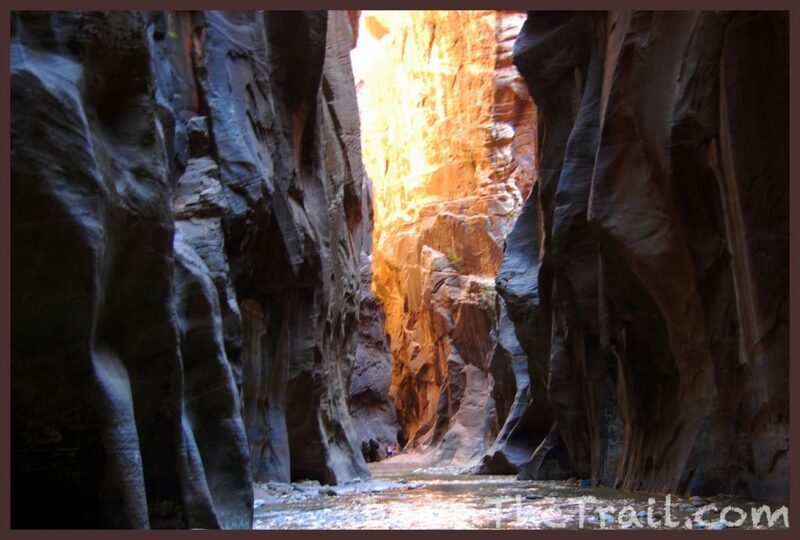 Most of Zion’s narrow slot canyons are highly regulated, where permits are necessary and it’s recommended to have an experienced guide. 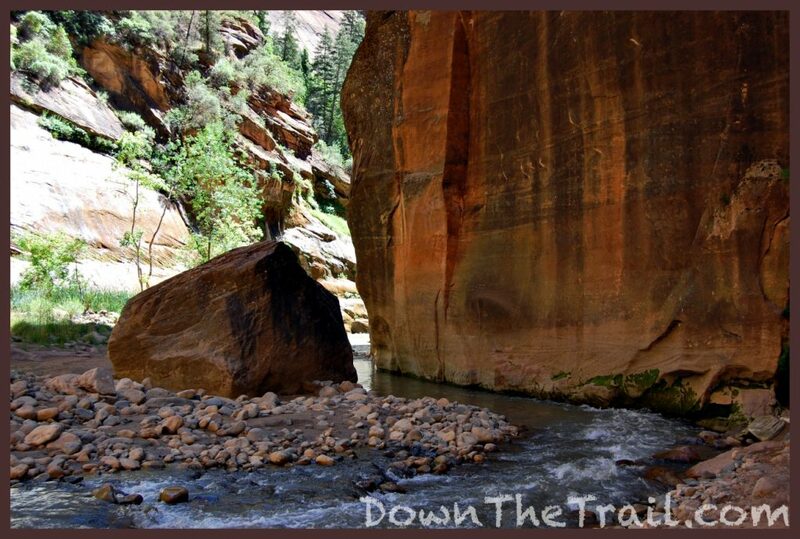 This is not the case for the lower Narrows! The risk of flash floods in the Narrows is serious. Don’t take it lightly. You will get wet. When you’re wet, you’re more likely to get cold. Plan accordingly. Water depth fluctuates seasonally, but it’s rarely chest deep or more. If you encounter water that’s this deep, there’s probably a better way around it. The footing isn’t as horrible as some say, but good, normal hiking shoes are a must. Sandals are a no-no. Regular shoes will do the trick – you don’t need to rent anything fancy. 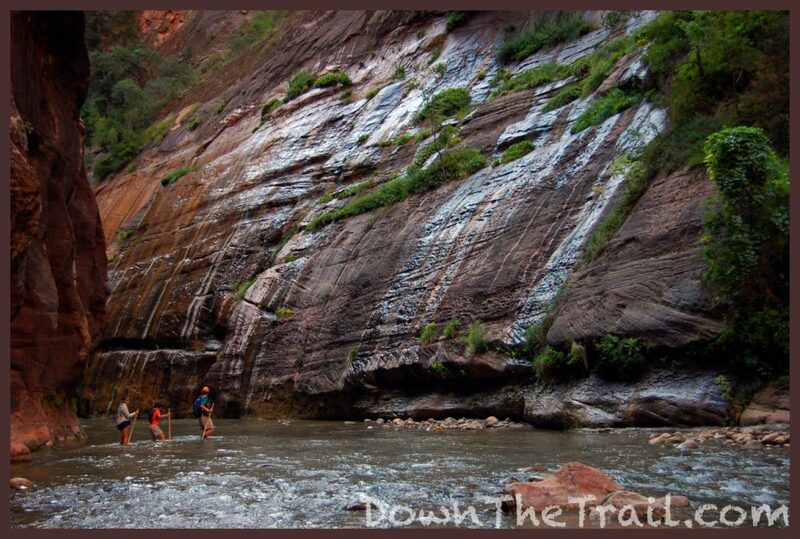 Rather than just exploring the lower narrows as described here, hiking from the “top-down” is often touted as the “to-do” hike in Zion. It’s a grueling 18-mile trek where you must be very organized to have all the logistics in place regarding the seasonal timing, permit, private shuttle, and more just to get to the trailhead. Conditions in the Narrows are extremely sensitive to local weather, so it’s not uncommon to ace all the planning and still get turned away! So frustrating! 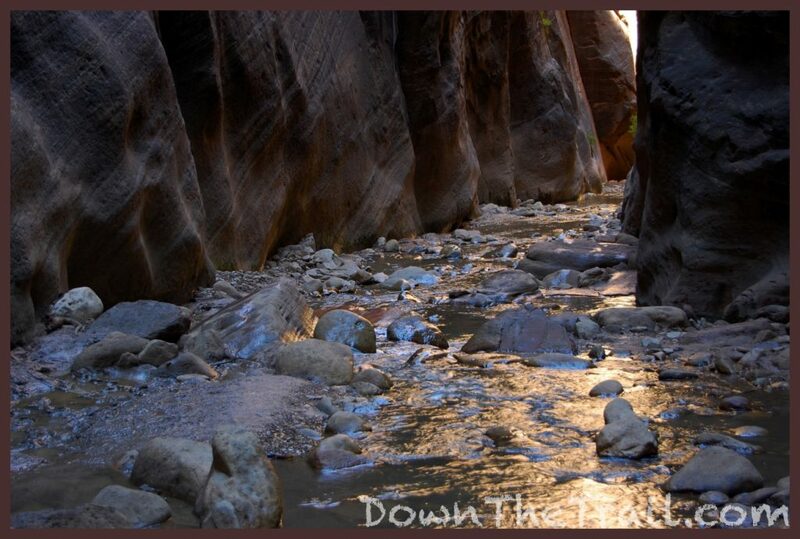 I’ve done the length of the narrows from the top down, and my opinion is the most impressive section of all is this lower third of the canyon – specifically everything downstream of Big Springs – specifically the part that it’s easiest to day-hike without a permit anyway. 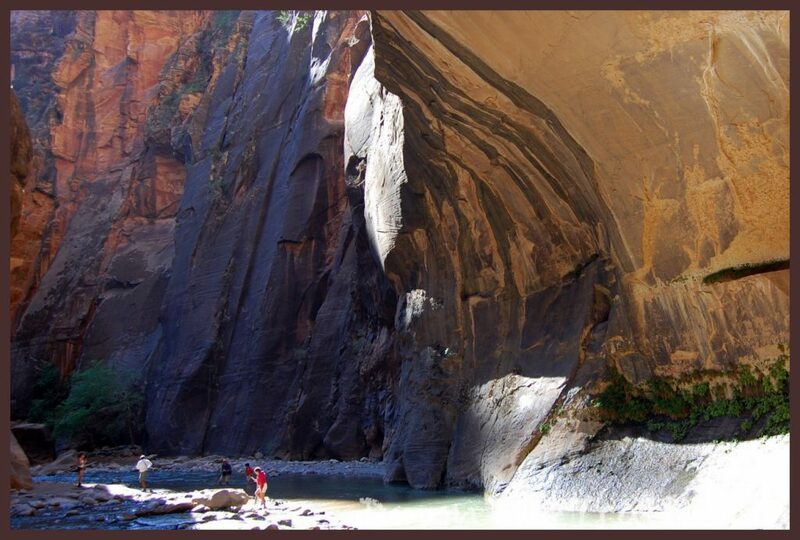 Zion is a busy park with a lot of technical canyoneering and complicated logistics, allowing its local guiding businesses to thrive. Doing it all on your own causes a lot of headaches and disappointment from missed opportunities. 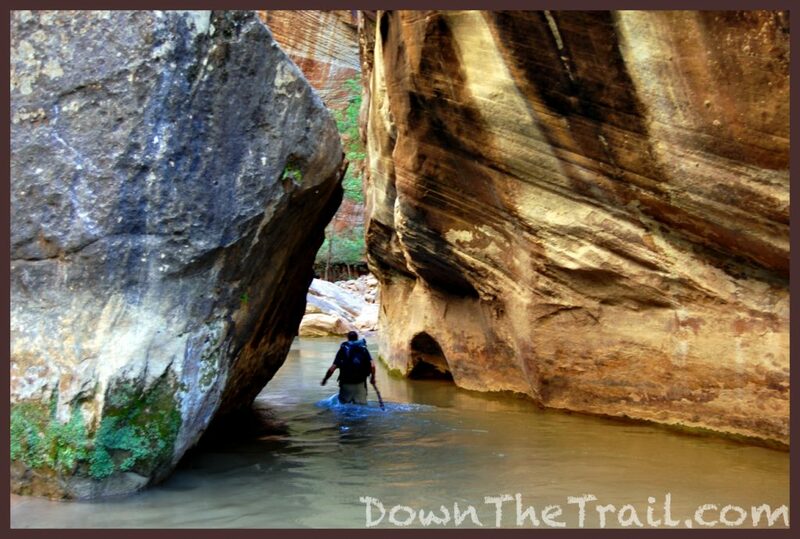 That’s not the case when it comes to hiking the lower narrows. You don’t need a permit. You don’t need to check in with a ranger. You don’t need to fill out paperwork. There’s no scheduled “reservation” for your hike (What is this, fine dining?). Just show up and enjoy yourself, on your own terms. If they are, is it so unbearable that it’s ruining your day? If the answer is no, then you’re not missing out. 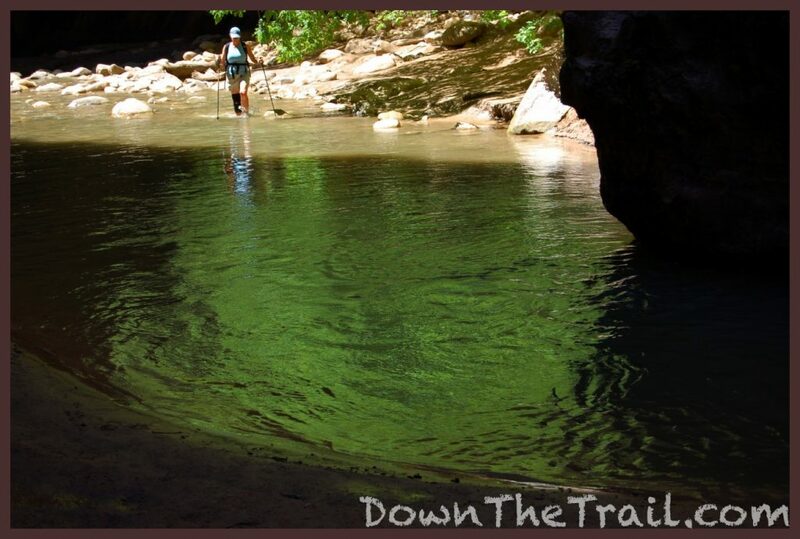 If you’re hiking the lower Narrows (Or even riding the bus to get there), you’re bound to hear plenty of people talking about how their hiking poles and neoprene socks are so wonderful. Ignore them, they’re basically just talking to themselves, justifying the rental fee and hassle of picking up and returning the gear. Somebody in Springdale talked them into renting this stuff, and they’re just trying to make themselves feel better about it. 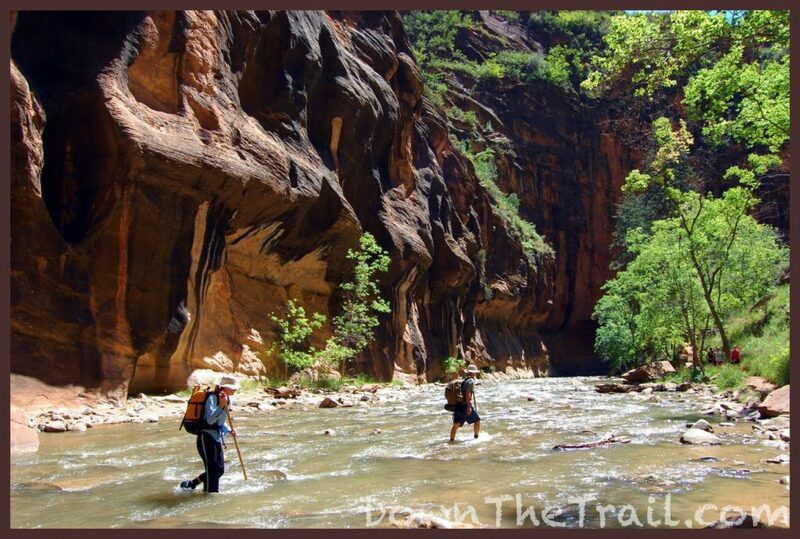 If you’re hiking the Narrows in warm weather, then you don’t need neoprene socks. …but if it’s cold, then they’re really nice to have. When is it cold? Generally after late September through early summer, or early in the morning is when I’d recommend neoprene socks. I own a pair, which makes things simple for me. In fact, you can basically buy a pair of your own for the same cost as a rental in Springdale. – Don’t get conned into renting trekking poles, either. 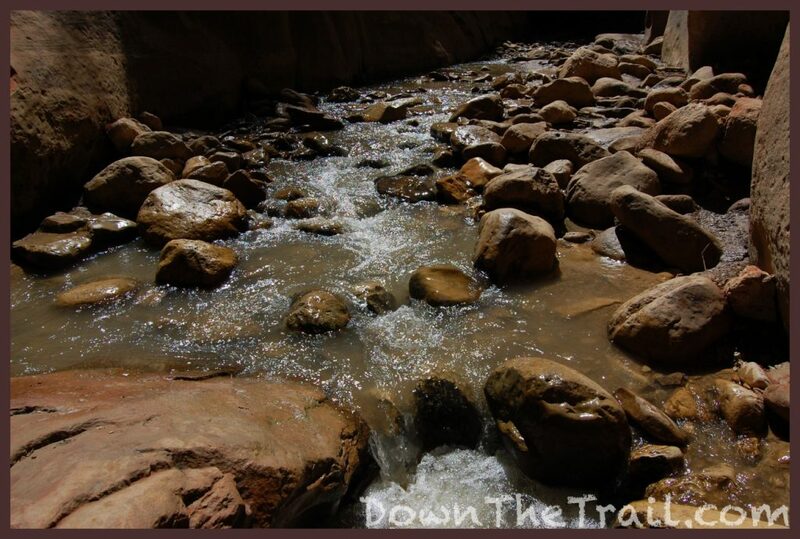 Hiking in the Zion Narrows basically means that you’re walking in a river, and I always recommend using poles or a stick when walking in water. It’s simply a safety concern – you’re more likely to stay up on your feet with extra stability. But if you’re day-hiking from the bottom-up, there’s likely to be a big pile of walking sticks at the trailhead. You’re almost guaranteed to procure an old-fashioned walking stick sooner or later, especially if you start in the morning. Be like Gandalf. – You don’t need a dry bag for this hike. We’re not going kayaking or whitewater rafting here, folks. 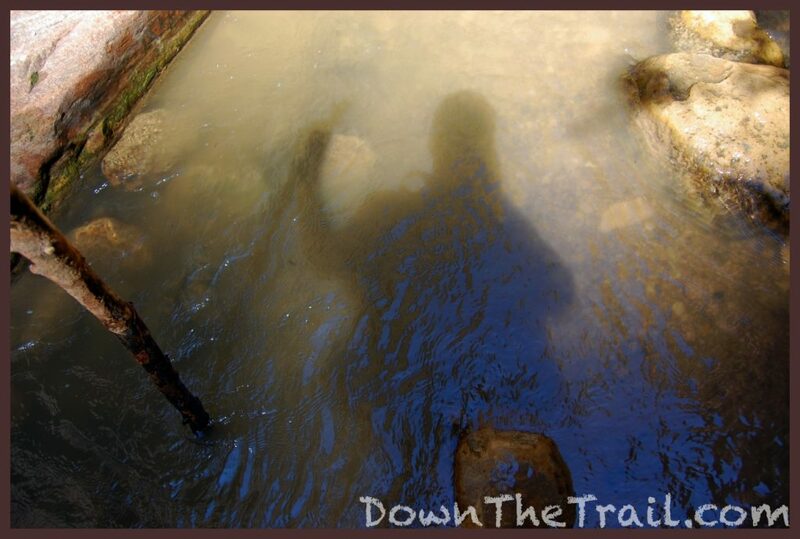 On this hike from the bottom-up you’ll most often be walking in water that’s knee-deep, maybe waist-deep. A couple of Ziploc bags ought to be just fine to keep your wallet and phone dry. You plan on keeping your backpack dry, don’t you? And if you slip and fall, is your pack likely to be in the water for more than a second? Probably not. If you’re determined to take no chances, these dry bags ought to do the trick. Investing too much love and anticipation in this hike is setting yourself up for disappointment. 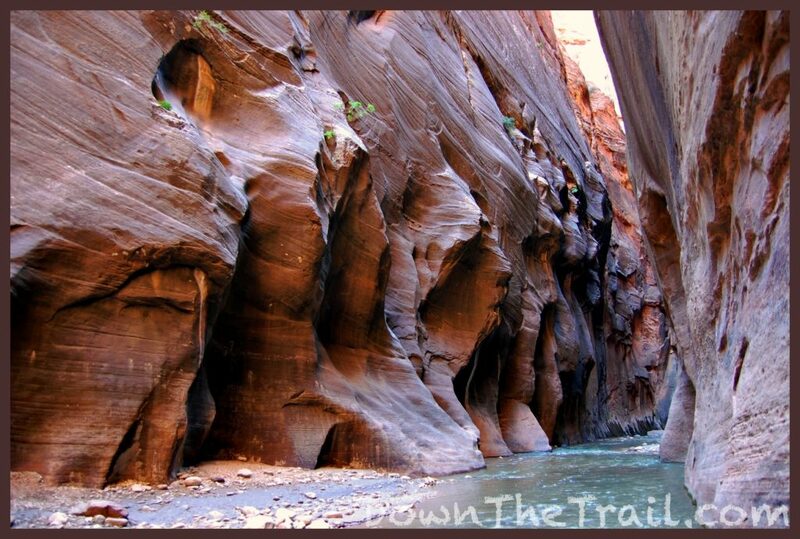 The Narrows are moody and fickle and won’t think twice about shutting you out. 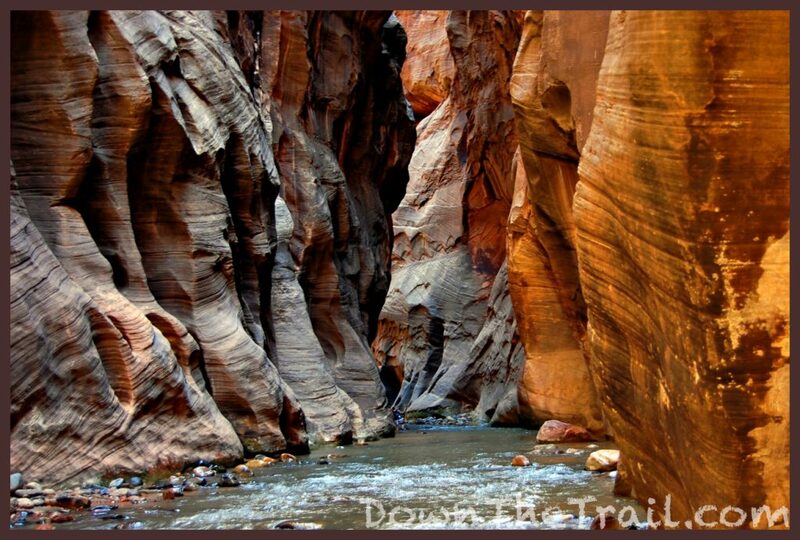 Narrow canyons always pose a safety hazard. When a lot of water comes flowing through these places, it can be deadly. 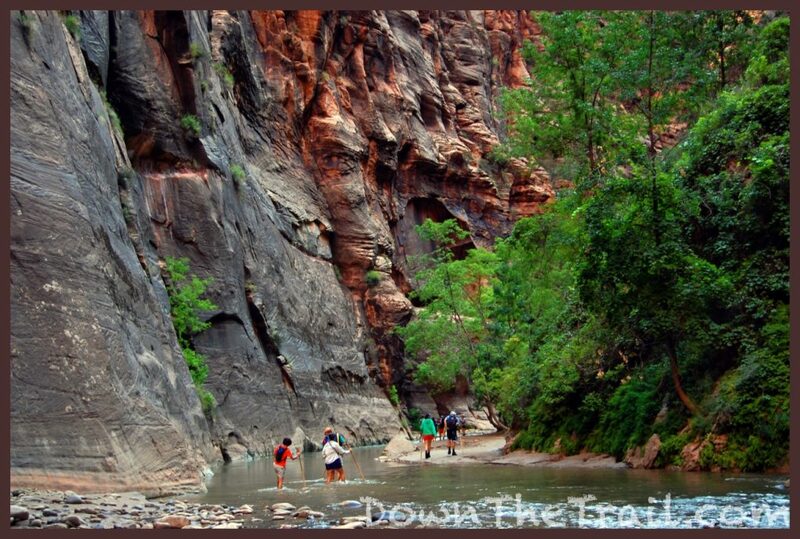 So the Park Service will often close the Narrows because of safety concerns. 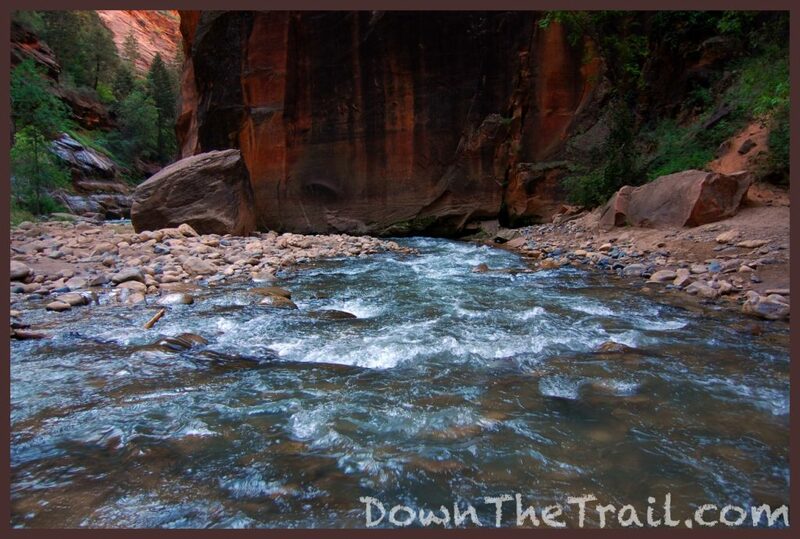 When the Virgin River flows at 150CFS (cubic feet per second) or more, the Narrows are closed. Sometimes this goes on for weeks and months at time, like when snow is melting from the mountains in the Spring. If it has been a heavy winter, a closure can remain in effect until mid summer! Prolonged rainstorms will also close the Narrows. July and August are the most dangerous times. Thunderstorms are frequent in Utah at this time of year, which can cause flash floods to come tearing down Zion’s canyons with little or no warning. This is serious. Always check the weather before you go! 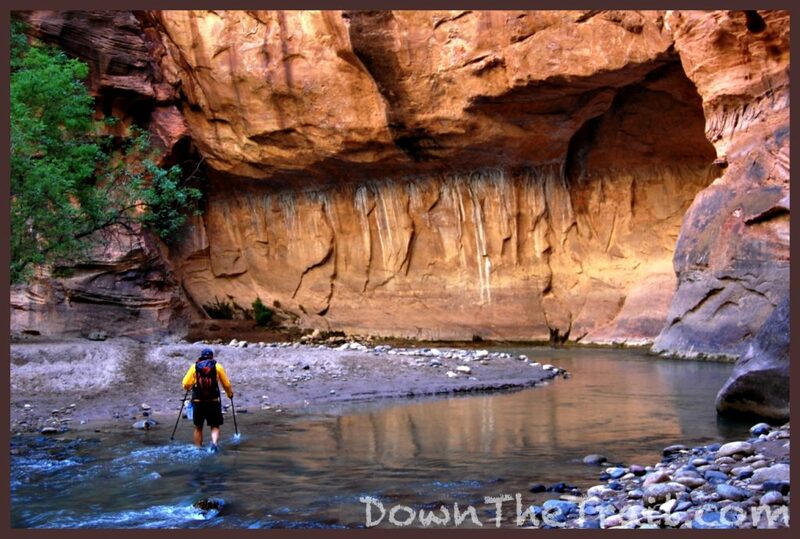 Just because the Narrows are open doesn’t mean that safety is guaranteed. 5) June and September are the warmest months, but consider winter! 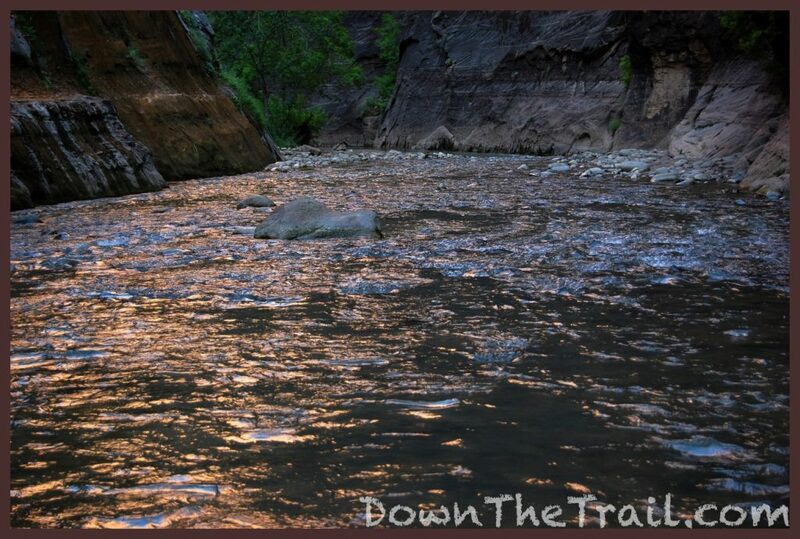 The best time to be in the Narrows is when you have the warmest weather and the least chance of rain or high water. That sounds like June to me. June is notoriously hot and dry in the desert southwest. May can be good, especially later in the month, but closures from melting snow are likely to linger into the first half of the May. July and August may be tempting, but there’s a high risk of flash floods at this time of year. However, hiking in the early morning when there’s a good weather forecast should be fine. In September the weather stays warm and there’s a decreased chance of flash flooding – my second most-favorable month. Early mornings and water temperatures tend to start getting cold in October. There’s also an increased chance of prolonged rainstorms at this time of year that can temporarily shut things down. 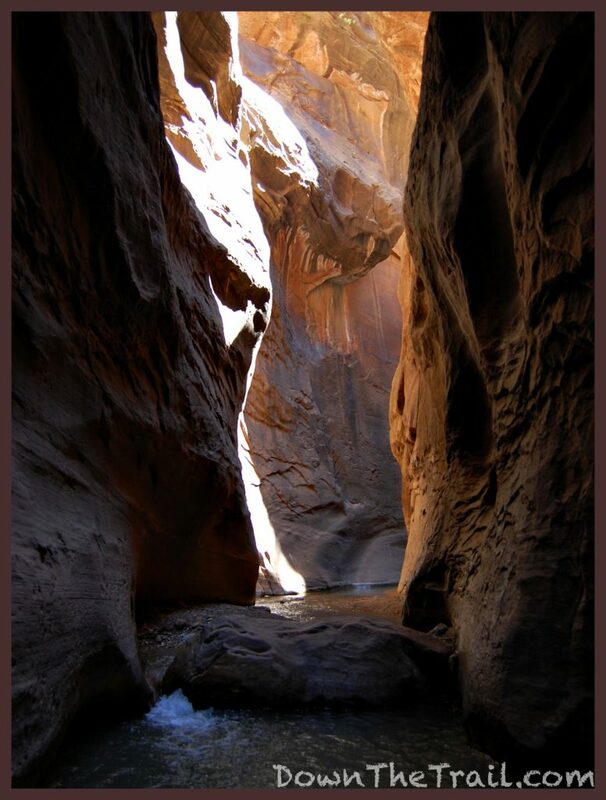 In March and April the Narrows are often closed because of high flows. You can beat the crowds in winter! The rest of the year is generally cold, but doable if you’re properly prepared. November, December, January, and February are all totally doable with a dry suit, or at least dry pants. Several of the outfitters in Springdale will be happy to rent you these items at a reasonable price. If you’re looking for the best local secret, this is it! 6) Start Early in the Morning, or Pay the Consequences. People love it, and they show up by the hundreds! 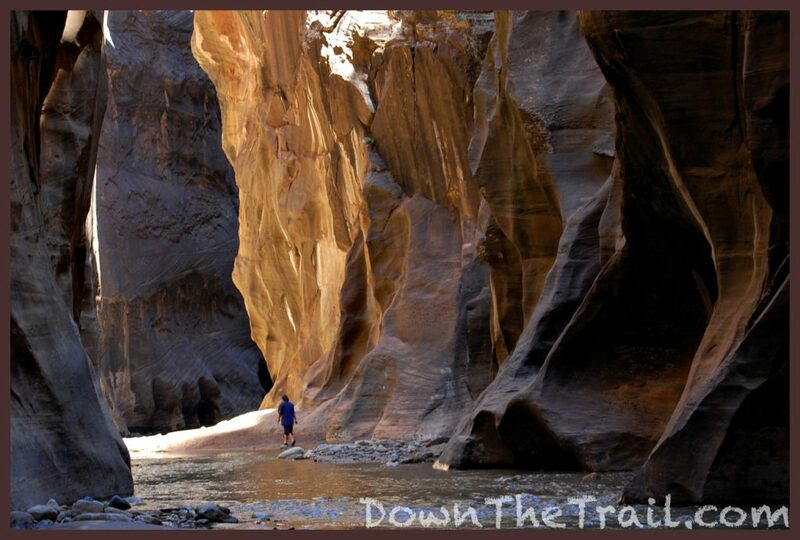 If you have an aversion to hiking with crowds of people, you’ll have to take some serious measures to properly enjoy the Narrows. Show up in Zion on the day before your hike, and find out when the first bus leaves the visitor center. It should be at six or seven in the morning. Then arrive at the bus stop at least half an hour before the first scheduled departure. There will often be a line that forms for the first bus, but that’s okay. It’s worth it. 7) You don’t need a map to find Wall Street. You’re going to follow the river upstream. After a length of time has passed (Depending on your plans for the day), you’re simply going to turn around and retrace your steps. 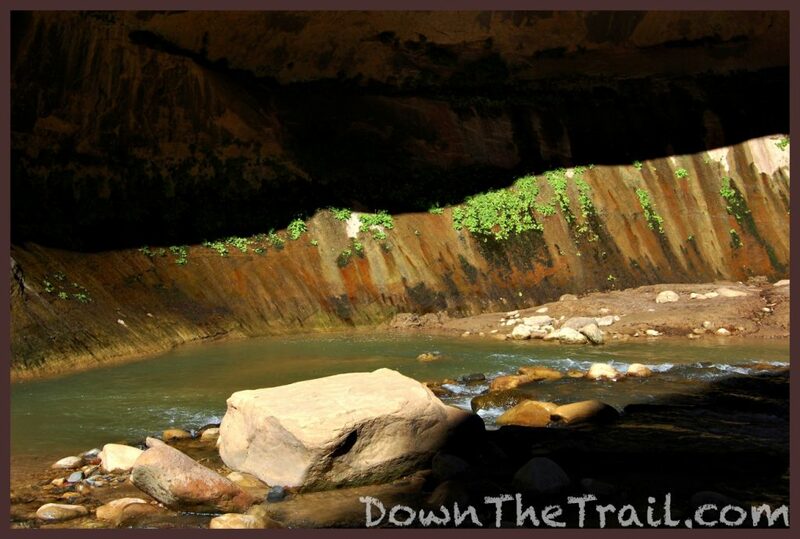 This hike is through a shallow river bordered by steep canyon walls. You won’t get lost. 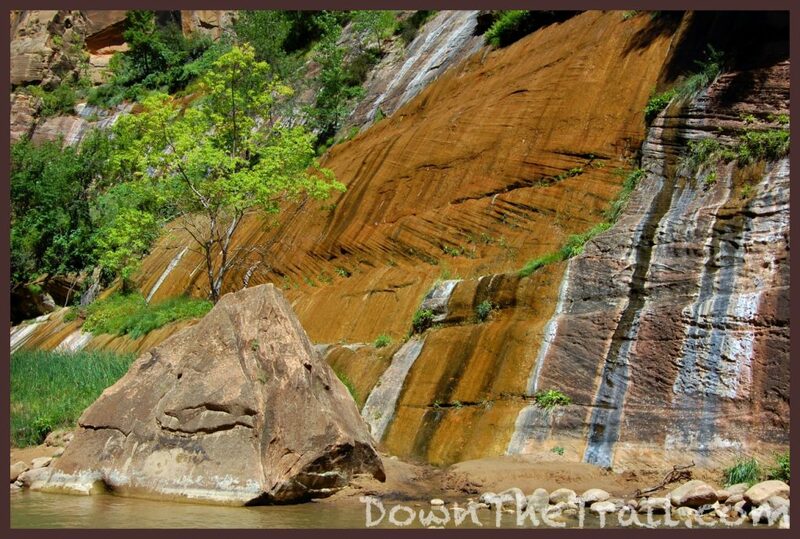 After hiking the paved “Riverside Walk” and properly entering the Narrows, the first landmark you’ll encounter after about a half-mile is Mystery Falls. 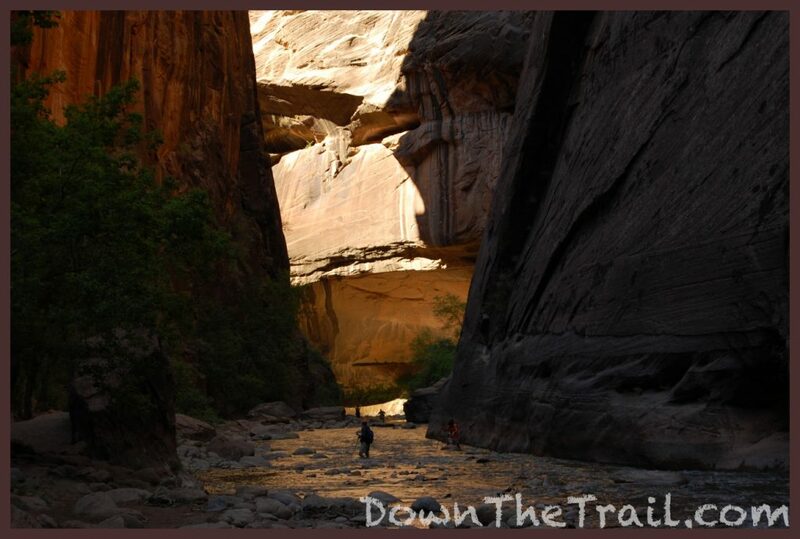 As you walk up-river, it will be on the right – a narrow stream of water flowing down a smooth, tilted rock face. If you’re on a casual outing this may be a good place to to turn around. This is actually the outlet of a slot called Mystery Canyon. 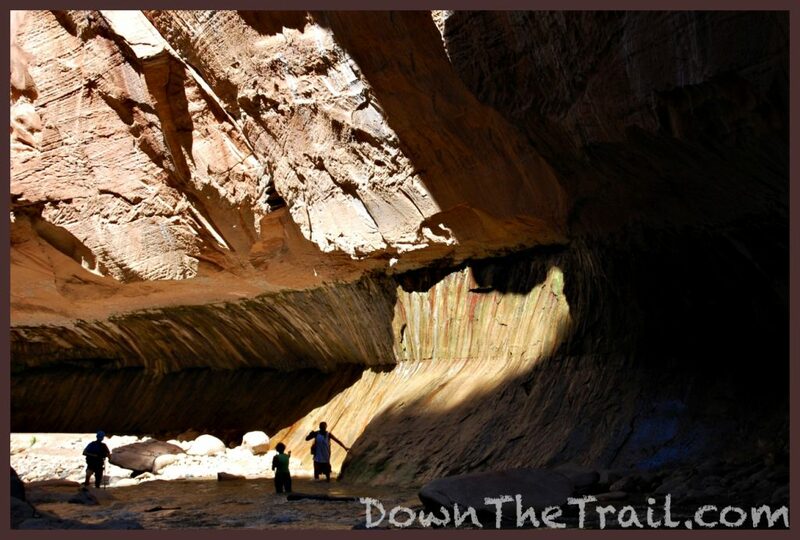 If you’re lucky you many get to see some canyoneers rappel down the rock face! 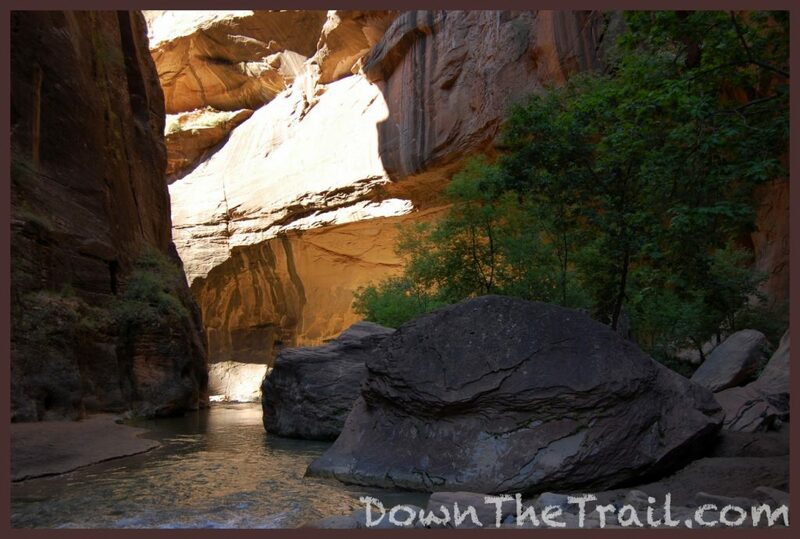 After trudging up the river for about another mile and a half, Orderville Canyon is the next major landmark. It’s also a good place to start thinking about turning around. It’s fun to explore up this side canyon. Soon, however, you’ll come to a short waterfall fronted by a deep pool, known locally as Veiled Falls. At first glance it may not appear to be such an obstacle, but several hikers have been injured here. 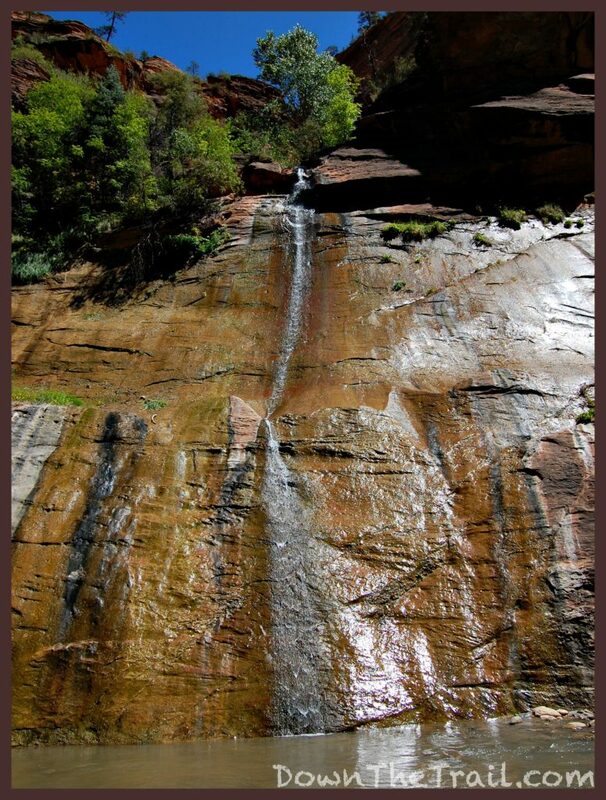 The term “Wall Street” applies to the section of the Virgin River in the vicinity of its junction with Orderville Canyon – primarily upstream of this confluence. The shoreline tends to give way to sheer canyon walls. It’s necessary to stay in the water, and the effect is especially scenic and photogenic. The flash flood risk increases here too, with no high ground. 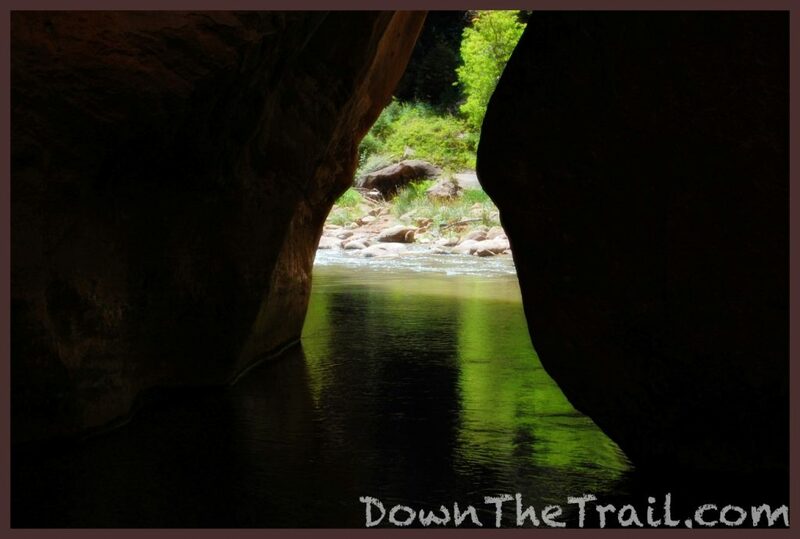 A five or ten minute walk upstream of Orderville Canyon will display the best that Wall Street has to offer. 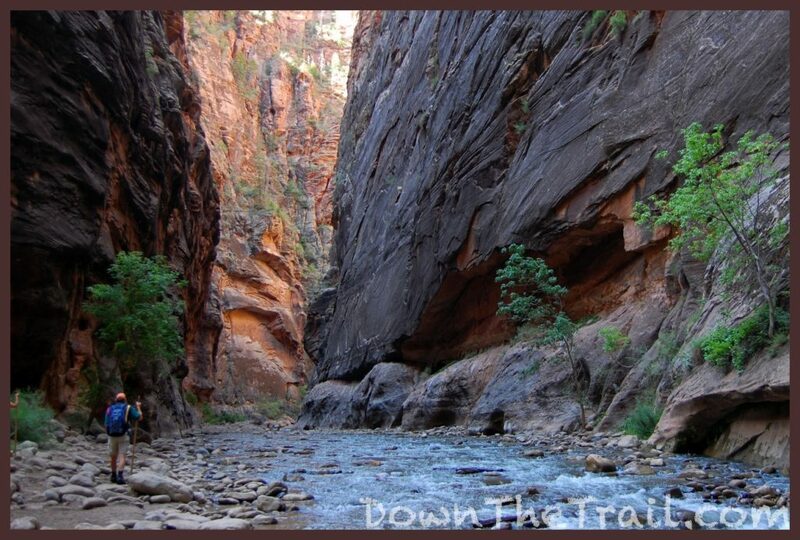 I’d hoped to hike the Zion Narrows as a top-down trip in one fell swoop. …but I missed the bus! It was my first visit to Zion National Park. Our company-organized trip from the South Rim of Grand Canyon was spending two nights at The Watchman, Zion’s main campground. After our arrival on August 24th I got straight to work. I jumped all the hoops – acquired a permit and booked a shuttle – to set myself up for a grueling top-down hike on the following day, August 25. The weather looked good. 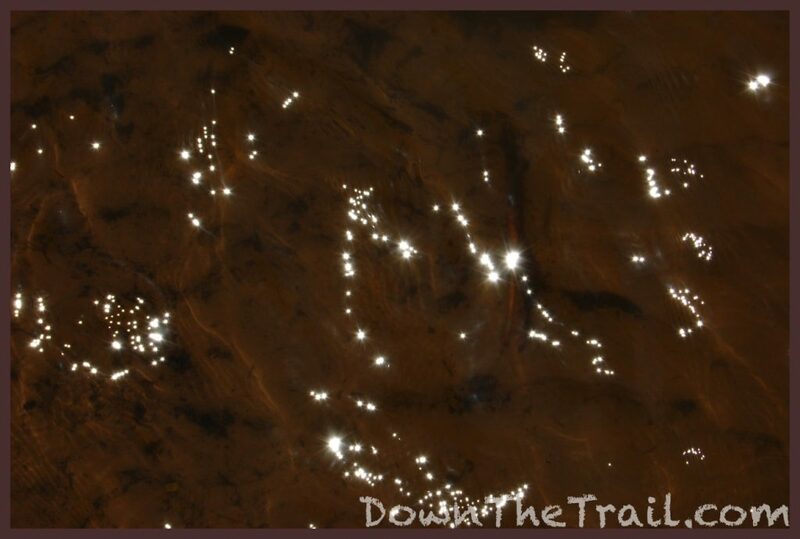 After all the plans were set, I still found time to hike Angels Landing that same evening. I woke in my tent on the morning of the big hike. It was long before the sunrise and still completely dark outside, but I was determined. By the light of my headlamp I walked out of the Park to the town of Springdale, where the commercial shuttle van operated by Zion Adventure Company would pick me up for the drive to Chamberlain Ranch. I still felt half-asleep and was barely functioning. 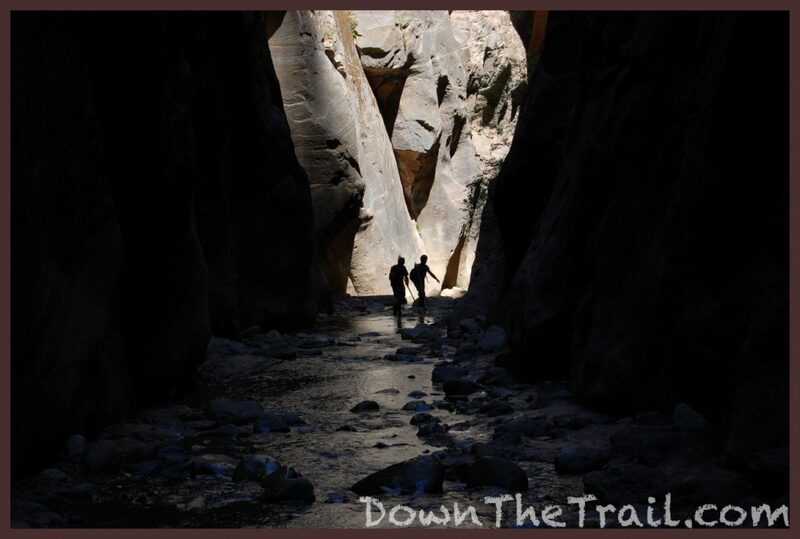 In the dark night I saw a bright sign that said “Zion Adventure Company.” Good. I sat down and waited. There was no activity there, and ultimately no shuttle. I was waiting at the wrong place! By the time I realized my mistake, it was too late to walk to the real pickup location. In hindsight, this was probably for the best. 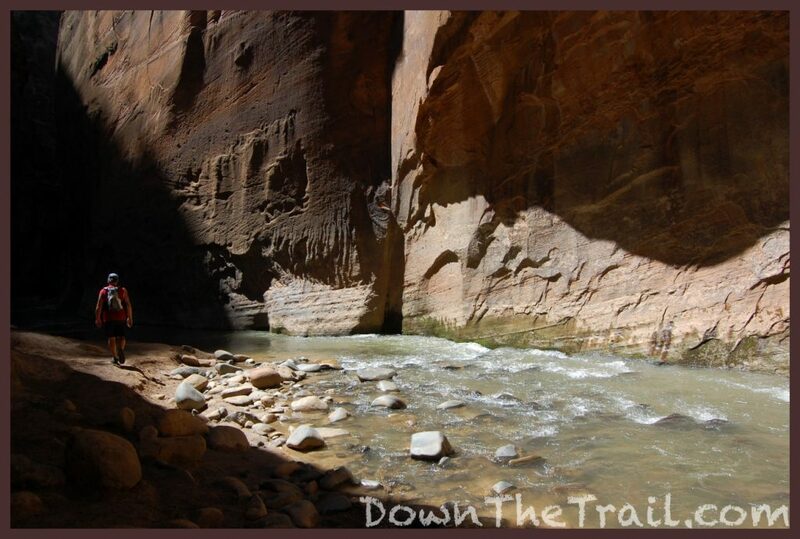 I finally got to do the Narrows as a top-down hike the following year, late in 2009, and it was an exhausting day. I was under-prepared and lacking the necessary energy on this previous trip. I like to think that my subconscious knew I was stubbornly asking for trouble, and messed up the shuttle pickup on purpose. So I went back to the campground, took a nap, and did the Narrows as a bottom-up day hike to Wall Street Street later that afternoon. 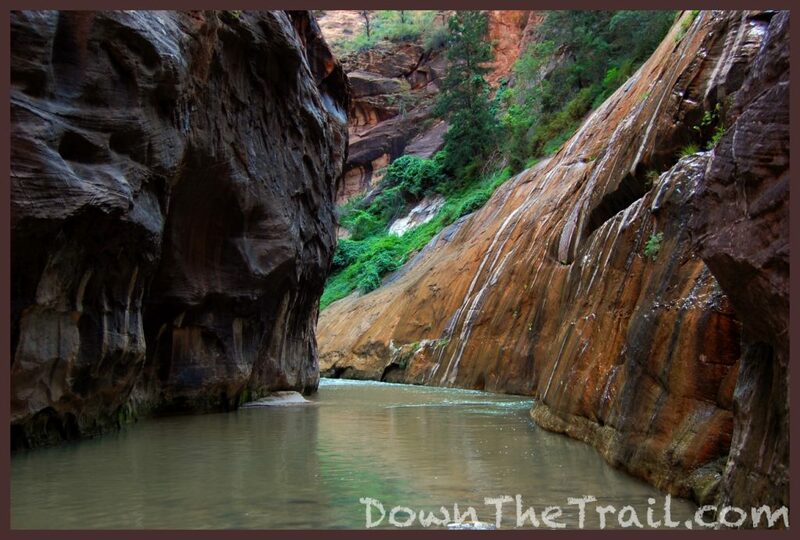 Have you explored the Zion Narrows from the bottom-up? How was your experience?